When you are coaching a team of players with large differences in skill level it can be an enormous challenge to meet the needs of every player. We are not talking about the social or emotional needs they have, but more the physical and training needs. This aspect of coaching a youth team is actually as important as any other aspect or angle. Often overlooked in the tips and tricks that youth coaches are given, we at Hustle Training see this as one of the linchpins of a good coach - and what can help you stand out among your peers. That is why we have included this in our blogs. 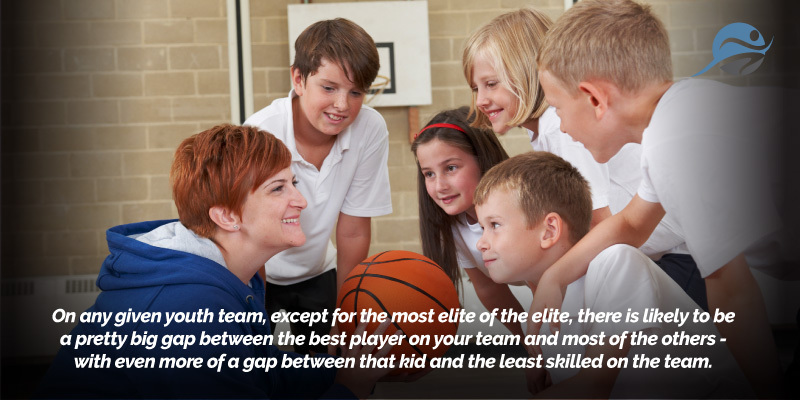 On any given youth team, except for the most elite of the elite, there is likely to be a pretty big gap between the best player on your team and most of the others - with even more of a gap between that kid and the least skilled on the team. How does this happen and is there anything that can be done about it? The answer is that it depends - and some of this comes back to a coaches capabilities. The rest depends on the talent and skills that the children on your team bring to the table when they walk onto the court or the field, with or without you. The fact is that there are some people who are naturally talented in sports. Sometimes the person has played and practiced prior to walking into your life and onto your team - they know the rules and can play the game. Others are there for the first time and have raw talent that needs to be harnessed into skills. Either way, as their coach you can help to develop them and build the team. Then there are the other players, those who do not have any particular talent for the game and/or those who do not have any particular skills that will help. As a coach, it is also your responsibility to help bring these kids along, make them part of the team, and use the time that you have with them to enhance their sports experience. This is important because all of these kids deserve that opportunity (and in private league situations parents are paying for that) and that there are some kids who may end up even going pro someday but they are just late bloomers. Some kids that are extremely talented are in fact late bloomers in sports. As a coach it is important to know this and to recognize that every kid on your team has potential. The Mirriam Webster definition of potential is: “existing in possibility: capable of development into actuality.” Not every child showing a gap in skill and talent today will bloom in the future, but certainly each of them might. Some children are early bloomers who enjoy success in sports because they develop faster, not because they have more raw athletic talent. Some children - even if they appear to only be average athletes or lag behind his peers - may be late bloomers whose athletic talent will only become apparent later when they are teenagers; they may ultimately be more gifted athletes… As a 2004 article in the Journal of Physical Education, Recreation & Dance observes, because athletic success involves multiple factors, including genetics, mental attitude, access to training, and money, any attempt to predict future achievement based on how skilled your daughter is at age nine, ten or eleven "is likely to be futile." Each child follows her own unique developmental timetable. While chronological age provides a rough index of developmental level, differences among children of the same age can be and often are great. In other words, as one expert observes, while "development is age related, it is not age dependent." This begs the question: as a coach, how can you handle this? One of the best ways is to assure that you have a coaching plan for each and every team member. This means taking note of each of them and coaching them where they are at, with the same respect you give to your most advanced players. In other words, do not play favorites with your youth team. Coach each as though you are personally responsible for their talent development - because you are. It is imperative as a youth coach that you have a plan to help develop the skills to play the game and to encourage any youth who are even remotely talented to develop those skills. For really small kids it is highly unlikely that you can develop serious talent that hasn’t shown up. But you can absolutely help to teach them the skills that will be in place if they are a late blooming talent (which shows up between 9th grade and early adulthood). In most sports, talent identification starts to make sense as kids enter their teens and begin to mature physically, emotionally, cognitively, and socially. It’s also an appropriate way for kids with possible talent, and a strong desire to compete, to start to experience increased challenges in competition. (Source). This may feel like a lot of pressure on you. But rest assured you are not alone. Many other youth coaches are experiencing the same thing - trying to meet the needs of all players in practice.